The nutmeg tree is any of several species of trees in genus Myristica. The most important commercial species is Myristica fragrans, an evergreen tree indigenous to the Banda Islands in the Moluccas (or Spice Islands) of Indonesia. It is also cultivated in India, Malaysia, West Indies, Sri Lanka and Grenada. 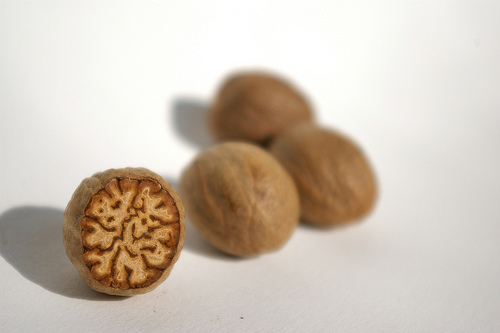 Nutmeg is also known as; muscider, magic, muskatbaum, myristica, nux moschata, muscdier and nuez moscada. The nutmeg tree is very tall, may reach up tp 70 feet. The nutmeg tree is important for two spices derived from the fruit: nutmeg (seed) and mace (covering).Nutmeg oil is obtained from the seed of the tree's fruit. Oil is colourless or light yellow, and smells and tastes of nutmeg.It is used to replace ground nutmeg, as it leaves no particles in the food. The essential oil is also used in the cosmetic and pharmaceutical industries.Nutmeg butter is obtained from the nut by expression. It is semi-solid, reddish brown in colour, and tastes and smells of nutmeg. Did you know that mace is much more costly than nutmeg because its yield is about ten times less that of nutmeg? Did you know that one whole nutmeg grated is equal to 2 – 3 teaspoon of ground nutmeg? Fats and oils in nutmeg contain thousands of unidentified chemical compounds. Among the known are an odorless fat (trimyristin) and a volatile oil (myristicin). 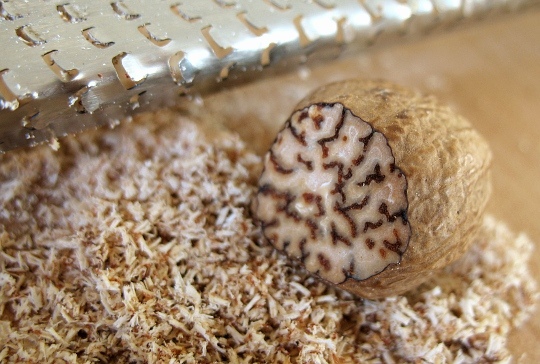 The smell you sense while grating nutmeg comes primarily from myristicin, elemicin and safrole. 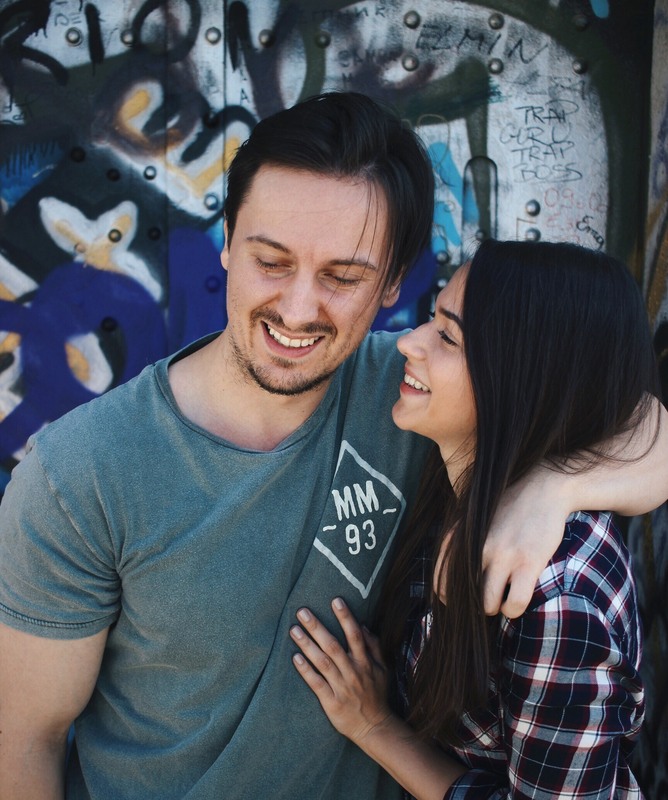 Myristicin causes hallucinogenic effects which some users compare to LSD. 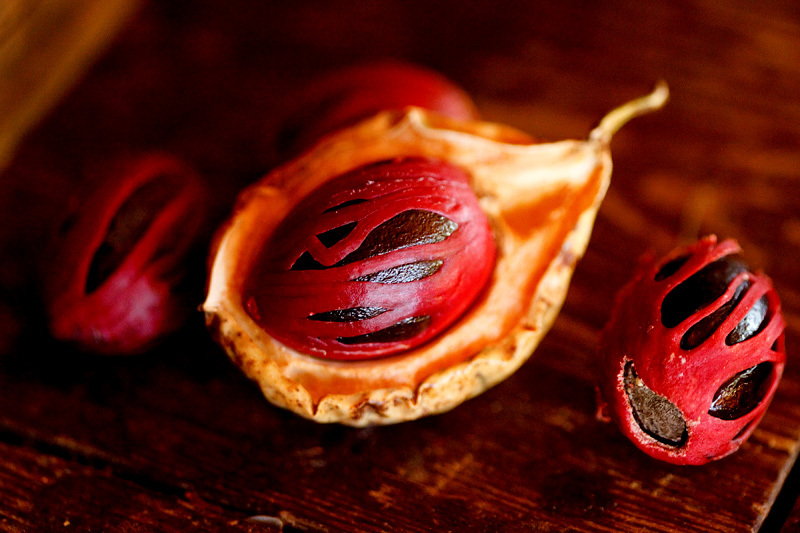 When consumed in excess, nutmeg can cause restlessness, elation and hallucination. Other symptoms of side effects include stomach pain, nausea, double vision, palpitation and delirium. Besides, it may cause allergy and trigger asthma. Large doses can even cause coma and death but only 2 deaths are noted. In one case, an eight-year-old child ate just 14 g of nutmeg and died from the effects and the other case if of a 55-year-old adult, attributed to a combination with flunitrazepam. 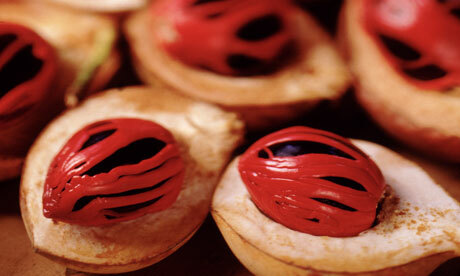 Did you know that a nutmeg tree takes 10 years to mature and produce nutmeg? Also note that nutmeg was once considered an abortifacient, but may be safe for culinary use during pregnancy. Women who are breast-feeding should not use nutmeg either.Touching the nuts can cause an allergic skin reaction. 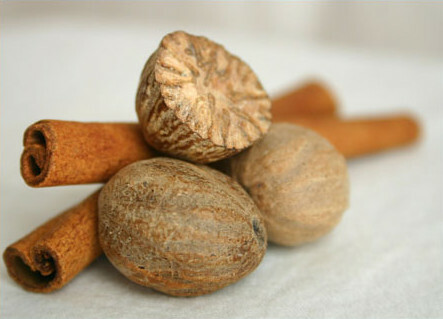 In the home, nutmeg should be kept out of the reach of children and pets.However, it inhibits prostaglandin production and contains hallucinogens that may affect the fetus if consumed in large quantities.Exactly how much nutmeg you can tolerate before becoming ill depends partly on your body mass. From 1-3 tbsp of nutmeg powder or 1-3 whole nutmeg seeds causes illness in most people. The effects ebgin 2-6 hours after ingestion and the delay causes some users to take an extra dose. After the effects of unpleasant nutmeg experience. a long-lasting aversion to nutmeg can frequently be developed. Thus, although nutmeg (Jaiphal) benefits in providing relief from a number of health issues, you should take it sparingly in small doses (not more than 3 to 10 grams). 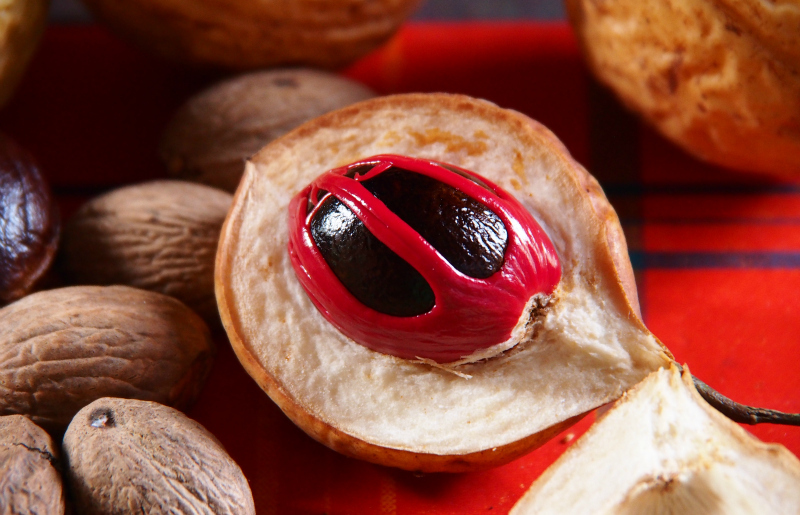 Did you know that between 10,000 to 12,000 tons of Nutmeg are produced each year! You just need a pinch of nutmeg powder (you can grind it yourself) and add some milk and mix together to make a paste. Apply on clean skin with gentle circular motion. Leave the paste for a relatively long time; about an hour. The paste will also help eliminate blackheads as a gentle scrub. Make a srcub by mixing ground nutmeg with some water and scrub away the scaly skin, but be gentle. Make a mixture of 1 tbsp of ground nutmeg + 1 tbsp of honey (unprocessed if possible). Apply the mixture with clean fingers on previously cleaned face, focusing on the area affected by scarring. Let it sit on the skin for 20 minutes and wash with lukewarm water. If you could apply Aloe Vera after this treatment, it would be wonderful! You can do this 2x daily (morning and night) until the scars fade. When dealing with a cold, you can use nutmeg in three ways. The first one is best when you have nasal congestion and you can treat it with nutmeg and cinnamon in 1:1 ratio. But if your chest hurt than you can make a paste of nutmeg powder, flour and water. Apply the paste with a cotton cloth on the chest. This one includes 5 drops of nutmeg oil mixed with 1 teaspoon of honey or sugar. You can massage your temples and forehead with a solution of nutmeg oil mixed with rosemary oil. Did you know that whole nutmeg keeps almost indefinitely stored in airtight containers, but ground nutmeg loses its flavor very quick? What do you think of the mystical nutmeg? Have you ever tried it, in cuisine or otherwise? Do you like the smell of nutmeg? I simply love it in a wonderful perfume called Yves Saint Laurent L'Homme Libre. Mmmm…delicious!